Scientific market research really made a name for itself in the mid- 20th century, establishing many practices still in use today: questionnaires with non-leading questions, multiple-choice answers, anonymous respondents, all generating data used for extensive statistical analysis. With all the success large corporations and politicians have seen with market research over the years, most businesses implement these same practices without a second thought when trying to gauge customer satisfaction. The trouble is, the advent of email and online survey platforms transformed the economics of patient questionnaires–it’s now cheap and practically instantaneous to ask your patients what they’re thinking. 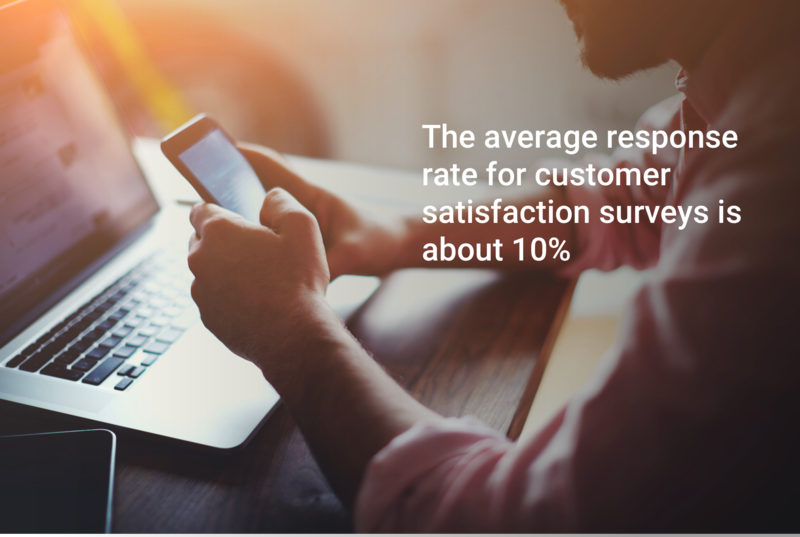 This means more surveys sent to each customer more often, which has led to ironic circumstances: the process of conducting customer satisfaction research often decreases customer satisfaction levels. But even this is difficult to determine since the percentage of survey respondents has dwindled to almost nothing: the average response rate for customer satisfaction surveys is about 10%. For patient surveys, this falls to lower than 10% on average. Such a low average response rate means whatever results you are receiving are shaded by non-response bias: this refers to when the respondents’ opinions differ substantially from the non-respondents’. The lower the response rate, the higher the non-response bias. Of course, as a business, you want to know as much as you can about your patients. However, if your survey is too lengthy, patients won’t just get bored, they’ll assume that the survey was designed for corporate objectives rather than to improve their experience. Timing is another factor to consider: if you wait too long to send your survey, it won’t elicit a response relevant to the patient journey. It likely won’t elicit any response at all, as it interrupts the customer’s day-to-day life. What is the patient’s goal? What needs must be met to reach this goal? What did they do right before? This affects how they will respond to an interaction with your practice. What will they do right afterwards? Understand how to best help them with later interactions. What will make them happy? They expect to be satisfied, but how can you go above and beyond their expectations to create a memorable experience? With these questions in mind, plan the structure of your survey. How can you avoid being lengthy and irrelevant? By being concise and in-the-moment. Keep your surveys as short as Millennials’ attention spans. 1-2 question surveys sent at critical touch points during the patient journey not only increase response rate, but enable proactive service. Reaching out when the patient is still thinking about your practice gives you time to remediate any problems they’re having and salvage the experience. Once you start stacking up responses, use them to their full potential. Analyze more than just your scores; examine the driving causes behind them to learn where operational improvements can be made. With the right approach, your surveys can help both you and your customers tremendously. Don’t diminish customer satisfaction by trying to measure it. Instead, use customer surveys to engage with, understand, and optimize the customer experience, consistently. Many of our clients use Patient Surveys and get very important feedback, good and bad, that can help our clients make improvements where they need to be made. So, surveys do work, you just have to know your patients.